pretty handmade necklace. Janelle at Sew Blessed made it for me. and she makes beautiful necklace pendants. I love mine! I adore the monogram on vintage paper. On the back is the definition of JOY. Perfect! 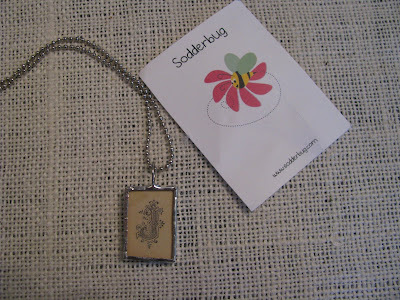 I bet you want a Sodderbug pendant too. You can get one by visiting Janelle's shop and buying one. Or you can leave a comment on this post to enter to win a charming, handmade necklace. First, visit the Sodderbug site and look at the photo gallery. Then come back here and leave a comment. Tell us which pendant you would choose---or suggest a new design that Janelle can make especially for you. You can enter a second time if you post about Janelle's Sodderbug site on your blog, Facebook or Twitter. The giveaway will run the entire week. The winner will be announced next Monday. I really like the simple monogram necklace. Thanks for hosting this giveaway! Cute! If I had to select my favorite I think I would have one with a picture of my boys and maybe their initials. How cute. I like the 8inch X 1.2inch photo charms. Thanks for the chance! I would love to have one of these with a picture of my two kids in it! They are darling, and thanks for this great giveaway! I would get a charm with a Bible verse on it. I would like a monogram with the dangly things hanging down. Cute Stuff! Thanks for the chance to win. These are so simple yet lovely. I would love a monogram one with a picture of my grandchildren on the back. Thanks for giving us a chance to win. What a great giveaway! I love the monogram necklace. So cute! I love them. If I could choose one, it would be a monogram or one with my kids names and their picture. She has some really cute styles. I really like a monogram one, like the one she sent you. I love that it's on vintage paper. Thanks for having the giveaway! I would pick one just like yours but put a picture of my husband and baby together! So cute! Lots of ideas at the photo gallery! I do like the Believe one, but I love your monogram one and would probably want one of those for myself. I love yours the best...but with my initial, of course!!! Thanks for such a precious give-a-way! Wow! So pretty! I love them all! I would love my kids picture or family picture. Definitely a picture of just my husband in mine! what a gorgeous pendant... the site is awesome too!! I would love a pendant with a picture of my 3 boys, one is no longer with us. Thanks for hosting the giveaway. I'd love a necklace w/ my word of the year!! Thanks Joy! I would have to get a square one with a picture of my daughter & husband together. Love these. 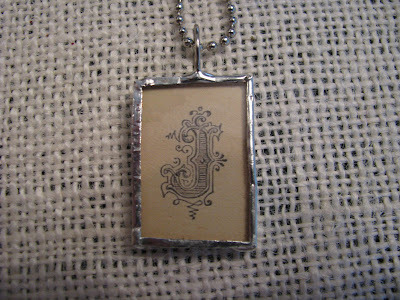 I like the long rectangular pendant with the name on it. I would love to have one with a picture of my mom on it. She passed away a few years ago. I even have the perfect picture of her. It is a black and white taken when she was a little girl. I look just like her. I love the one with Mom on the back and a picture on the front ... I lost my mom six months ago and miss her so very much. I love them! I would love one with a picture of my little boy in it! Thanks for the giveaway! Oh, I would get the monogram one with an L on it. I like the square shaped ones. I would love a vintage picture of a bird and maybe a little bead charm or bird charm or something like that. The one with the Psalms verse has a cool bead charm on it. Very cute. How cute! I love fleur de leis or Monograms are always nice! I like the monogram like yours. It's fabulous!!! I like the tree one! I liek he simple monogram necklace and the one with the tree. There are a lot of great ideas! Probably the one I would choose is the tree OR I would create my own with a picture of me and my husband and something about love or family. I would love to have the photo one with a picture of my kiddos! I love to show them off!!! I like them all! I have 5 1/2 grandbabies, so it would be too hard to choose just one photo in that category. So I'd probably choose a simple monogram for myself. So pretty and so unique. hands down i would choose a pendant with a picture of my kids. what better way to keep them close to my heart when we are apart? I would choose one with a picture of my brand new granddaughter on the front! Thanks for the chance to win! i like the monogram necklace! Great giveaway. My fav is the 2nd one that says believe. One that simply said "conpidence" would be good cause I was always telling my girls"I have conpidence in you." Janelle has done a fabulous job with these necklaces! I love the monogram you received, as well as the one with the name (I think it has the name Cooper Hart on it). I would definitely go for the one with the tree...so lovely! I have to say I like your monogram the best, but I would also like one with a fleur-de-lis or a pewter heart. Beautiful pendants! I would love a picture of my kiddos in one with their birthstones hanging from it. I would wear it all the time! Thank goodness she doesn't have 100 of these; there would be no way I could choose. I had a hard enough time with the ones she has. I think I would want a monogram one. She has a lot of very cute charms but I think I like your monogram the very best. I like the tree silhouette necklace! These are beautiful! I love the "Believe" necklace, but I would have it say "Choose Joy". I like the ones with something dangling under the main charm -- like the "Believe" one. Very nice. Thanks for the awesome giveaway. I love the monogram. Her work is beautiful. I just adore the pendants with the kids pictures. What an original idea. Thanks for the opportunity to enter. I love the monogram necklace! But, all are wonderful!!! I think it is met to be that I win this one, because I went to the photo gallery and there is a necklace with my exact initials (monogram) for my full name, that can't be a coincidence, can it? Love her jewelry!!! What charming, and unique pendants! I adore the monogram she sent you (of course mine would have to be an A...LOL). Thanks for the chance to win one of my very own! I LOVE the one with the tree. What beautiful jewelry it is. The necklaces are all adorable! I might get one with a picture of my 2 boys to give my mom for her birthday coming up. honest i like the one with my initials and maybe a bible verse. sooo cute! I looked at the gallery, but like your vintage monogram the best! I'd love one with my initial on it! Thanks for sharing such a great giveaway with us! These are so cute! Love the one with the kids and the quote on the back (in her great idea section). Just perfect! I would choose a rectangle with a picture of my 3 beautiful kids and a W on the back. These necklaces are beautiful. Id be happy with any of them. Love Pinkalicious for my granddaughter! Super beautiful! I would be lucky to win any of them! What creative pendants! I love the o one with the tree, not sure what it's called. It reminds me of my runs in the mountains! Great giveaway! I love the necklace with the tree photo. Simply beautiful. I would love one of the picture pendants. I like the tree photo pendent. It is beautiful! I like the heart - it's a timeless image and has so much meaning - in other words - it's not just for Valentine's Day! And I especially like the ones she's done with a zig zag edge on the solder. Ooh, this would be a wonderful gift for my little sister who is going on her mission in March. She absolutely loves the story of the tree of life and is always looking for things with trees. I would pick the lovely skinny tree pendant. Thanks for hosting this giveaway! I love the pendants, but I would like to see one done in vintage (or other) lace. I love those. I would love to have one with my Mom's photo. I like the monograms but we love one with a Fleur De Lis. So pretty! I love the monogram style. Thanks for the great giveaway and for such an inspiring blog! I like the simple monogram - but it's a hard choice as they are all so cute! My daughter would LOVE the pinkalicious or Cinderella pendant! The charms are great! Some are cute and others are more elegant. The picture of the tree in b&w is pretty. I would like to put a b&w pic I made of an angel on one side and a bible verse on the other. Thanks for giving us the chance to win! The charms are great! Some are cute and others are beautiful. I love the one with the b&w tree. I have a picture I took of a b&w angel; to have that on one side and a bible verse on the other would be my pick. Thanks for the chance to win one of your works of art! Normally I don't care for things featured on giveaways, but these are lovely...I would like one that says Be Thankful...as you mentioned in one of your postings...for my charm bracelet. I love the monogrammed one too! I love the blog buttons, what a fun way to share your site!